The NordicTrack C 1650 is the quintessential treadmill from the leading name in the fitness equipment industry. It has everything you would expect to see in a NordicTrack machine – sturdy build, stylish design, powerful motor, and a range of innovative features that you do not often find in other treadmills in the same class. Is this the right machine for you? More importantly, is it worth the price tag? Let’s find out with our in-depth review. Belt : 20″ x 60"
Maximum User Weight : 320 lbs. The 10″ touchscreen display shows the workout stats in full color. It is fully web enabled and comes with an Android browser, which is a welcome addition to the series. The C 1650 comes with a built-in iFit module. All you need is an iFit subscription and you can make your daily workouts much more enjoyable and effective. An iFit account gives you access to personalized workout programs designed and coached by professional trainers all over the world. You have access to a huge library of workout videos, which you can watch in high definition. As an iFit member, you can track your progress and see how close you are to reaching your goals. You can compare your progress with other members of the community and even compete with them using the virtual race option. The best feature of iFit, however, is the ability to simulate terrains from around the world. Using Google Maps, you can choose a running trail and the treadmill will adjust its incline and decline automatically to mimic the terrain’s surface. You can watch the trail on the console and have a virtual outdoor running experience. This is very cool. The 3.5 CHP motor packs a lot of power and allows you to walk, jog, or run to your heart’s content. It is made with world-class internal components and is smooth and silent even at high speeds. The sensors in the handlebars give an accurate reading of your heart rate, which helps you stay in the right zone during your workout. The C1650 is also wireless compatible, just like the mid-range NordicTrack C 990, although the chest strap does not come with it as it does on some of the other models. The patented FlexSelect technology allows you to adjust the cushioning depending on your preference. You have two options – a soft, cushioned surface which is safe on your back and joints and a hard, road-like surface which offers the challenges of an outdoor running track. The OneTouch controls make it incredibly easy for you to use the NordicTrack C 1650. You can choose a workout program, adjust the incline and decline, increase or decrease the speed, and change the speed settings of the workout fan with the single touch of a button. 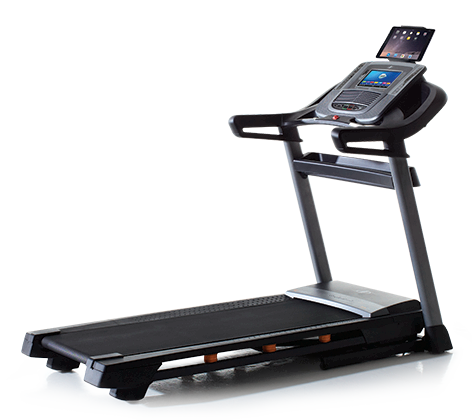 The C 1650 comes packed with additional features, which is a hallmark of NordicTrack products. The machine has a tablet holder, accessory tray, workout fan, and an iPod-compatible music system. The machine allows you to use a Bluetooth based wireless chest strap for measuring your heart rate, but again it is not included as part of the package. It is surprising as the C 1650 is supposed to be the most advanced machine in the C Series. The C 1650 has some excellent features that are usually found only in high-end treadmills (decline training and adjustable cushioning) and offers you plenty of entertainment options (music system, tablet, web enabled display) to make your training sessions enjoyable. It basically bridges the gap between a budget treadmill and a high-end commercial treadmill. It is one of the best treadmills you can get for the price tag, and is a solid choice regardless of your workout goals and level of fitness.